At the Crater of Diamonds State Park* in–of all places–Murfreesboro, Arkansas–you can “prospect” for diamonds in a 38-acre plowed field that is the eroded surface of the world’s eighth largest diamond-bearing volcanic crater. 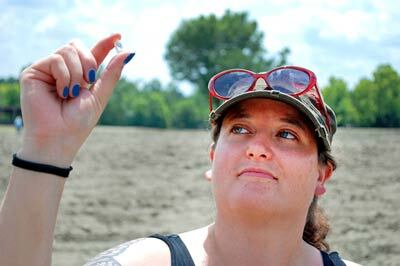 This woman found a diamond by digging in a field in Arkansas. If you’re willing to dig, you’ll uncover a lot of beauty in Revelation. Best of all, if you find a diamond, it’s yours to keep. But you’ll have to dig to find a lovely diamond underneath and by the way, who doesn’t love a diamond? Digging into it–and grasping an understanding of its Meaning and its meanings–is like digging in a field where the shining beauty of diamonds is not obvious. It takes a little effort–a lot more effort than listening to some money-grubbing TV preacher who claims to know that Revelation is about God destroying the earth. You won’t hear those preachers expounding much on all that is in fact so beautiful about all of the Book of Revelation. The fact is that the book’s beauty has inspired poets, painters, music makers (see Handel’s Messiah) and even dancers almost from the day John released it as a pastoral letter to seven developing churches struggling under evil Roman emperors. It’s in that chapter, after all, that Christ Jesus the Lamb is so beautifully worshipped–and the chapter where Jesus as Lamb becomes the symbol at the core of the book’s message of hope. Barbara Rossing, a Lutheran seminary theologian known for her book Rapture Exposed: The Message of Hope in Revelation, notes in an article on Revelation 5 that it introduces Jesus whose praise is joined by every creature in heaven and on earth and under the earth and in the sea” (Revelation 5:13). All heaven breaks loose in singing when the lamb is found worthy to open the scroll. Revelation is rich in such worship scenes. The hymns of Revelation are familiar from Handel’s “Messiah” (“Worthy Is the Lamb Who Was Slain”), from Charles Wesley’s hymns (“Salvation to God Who Sits on the Throne”), and from the liturgy (“This is the Feast of Victory for Our God”; “Holy, Holy, Holy”). 10. That Revelation is like a beautiful diamond in the rough–you might have to dig in the dirt to get it out but once you uncover it and take a look at its shining beauty you can see what a thing of great faith value it can be in our spiritual lives. *Here’s the link to the diamond park in Arkansas. “The powerful metaphor of Jesus as ‘the Lamb who was slain’ will become the central christological symbol of the entire book [of Revelation]. “This scripting of Jesus as a lamb is an obvious signal not to interpret the imagery of Revelation literally, but rather metaphorically. Just as Jesus was not literally a four-legged sheep or lamb, so Revelation’s other symbols and numbers should not be read literally.